Nutrition Education, a core WIC service, distinguishes the WIC Program from all other USDA nutrition programs. At PHFE WIC we are committed to providing meaningful nutrition education to our participants by way of interactive, learner centered classes and client centered individual counseling. Group Nutrition Education is designed with a keen eye on the population mix and cultural preferences of our diverse participants. We test our education designs extensively at several WIC sites in various languages. Using feedback provided from both participants and staff, we modify the messages and recipes to make them culturally appropiate to the target population. A variety of topics are presented for two specific populations: pregnancy (Prenatal Audience) and infants/children (General Audience) to age 5. Come to a Family Meal - Discussion revolves around reasons for a family to eat together, and the health value of a meal. Make your Meal matter - Obesity is a rising epidemic in this country. This was our opportunity to address obesity prevention by discussing caloric content of fast food items and how to make healthier food choices when eating out. Looking Lean, Cooking Light - Recipes that are traditionally made using full fat are analyzed. The discussion provides a platform for participants to make these traditional recipes using healthy substitutes as choices for the full fat ingredients, without sacrificing taste. Try something New - Discussion incorporates vegetables and fruits into daily meals and introduces vegetables or fruit to participants who may not be familiar with some of them. You are Special - Emphasis is on the importance of maintaining good health especially for women who plan on getting pregnant. It focuses on inter - conception health for both women and their male partners/spouses. Smartsize Your Meal & Supersize Your fun - Focus is on portion control and plate size. Supersizing your fun emphasizes on activities that bring both enjoyment and promote healthy lifestyles. 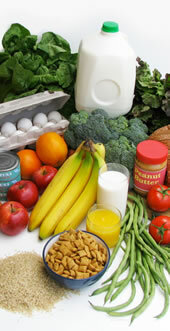 Individual Education is constantly updated with current nutrition information. We provide ongoing training to PHFE WIC staff both on nutrition updatesand techniques for engaging participants in meaningful discussions on the nutrition or health topic of their choice.